MOZART: Piano Quartet No. 2 in E-flat major, KV493 composed by Wolfgang Amadeus Mozart (1756-1791). For piano. Instrumental Solo Part and CD. 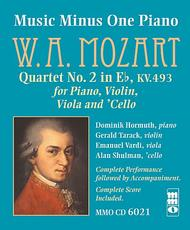 Published by Music Minus One (MO.MMOCD6021).ISBN 1596150955.When the influential publisher Hoffmeister canceled Mozart's series of piano quartets, the composer had luckily completed the second quartet, and it was published by another firm in 1786. Lucky for us, this classic of the chamber genre is one of the great Mozart compositions. The purity of structure, enchanting melody and beautiful interplay between instruments makes it a must-have for all pianists. The first-movement Allegro begins intensely but integrates gracious themes throughout. The Larghetto presents a richly conceived slow movement that features much back-and-forth between piano and strings, and a delicately beautiful ending. The third-movement Rondo (Allegretto) is full of fire and energy with much for the pianist to enjoy. In short, it is an essential and rewarding addition to any pianist's library. And this Music Minus One edition brings it to you in a beautiful digital stereo recording with a beautifully engraved new score.The package contains a newly engraved, complete music score, printed on high-quality ivory paper; and a digital stereo compact disc containing a complete reference recording of the quartet with Mr. Hormuth at the piano, then a recording of the accompaniments minus the soloist.